Model 403 Final Touch™ Print & Apply Labeler comes with optional label applicator tools to enhance production ease use when labeling cases and shrink wrapped bundles. It can apply side labels, top labels, corner wrap labels and two-panel labels. The unit applies labels from 1 to 4.25 in high and 2 to 12 in wide. The 403 is capable of labeling secondary packages at speeds of up to 60 ppm. The product is suitable for product manufacturers and contract packers handling foods, beverages, cosmetics, personal care products, household chemicals, pharmaceuticals, and nutraceuticals. MONTREAL, SEPTEMBER 11, 2018 – NJM, a ProMach product brand, introduces the Model 403 Final Touch™ Print & Apply Labeler at Healthcare Packaging Expo Booth #W-703. The 403 features a modular design, flexible PLC controls and a variety of optional label applicator tools to maximize production versatility and ease use when labeling cases and shrink wrapped bundles. “At NJM, we’re known for world-class equipment that is both innovative and reliable. In addition to designing new technologies, we continuously work to improve our field-proven machines. The new Model 403 is an updated version of our popular 402 – it offers a wider variety of options to expand its functionality while keeping the original system’s heavy-duty construction,” said Omar Azam, Inside Sales Manager at NJM. The Model 403 Final Touch Print & Apply Labeler is ideal for product manufacturers and contract packers handling foods, beverages, cosmetics, personal care products, household chemicals, pharmaceuticals, nutraceuticals and much more. The new 403 can apply side labels, top labels, corner wrap labels and two-panel labels with a variety of optional tamp or wipe-on applicators. Featuring a new swiveling yoke option, the labeler can be flipped from vertical to horizontal orientation to quickly change over between top and side labeling configurations. The 403 Final Touch applies labels from 1 to 4.25 inches (25 to 108 mm) high and 2 to 12 inches (51 to 305 mm) wide. A Zebra ZE500 thermal transfer printer achieves 203-dpi resolution and offers an option for 300 dpi. 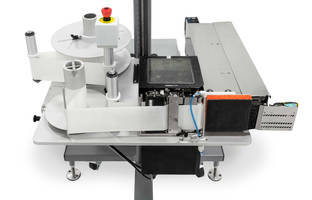 Depending on the application, the 403 is capable of labeling secondary packages at speeds of up to 60 ppm. The standard Model 403 is equipped with an updated Allen Bradley PLC and 4.3-inch (109-mm) PanelView PLUS 7 color touchscreen, with an option for a 5.7-inch (145-mm) HMI. The flexible PLC allows for additional inputs and outputs for different inspection systems and other extra controls that the customer might require. For pharmaceuticals, NJM can design the 403 to facilitate serialization and aggregation. The Ethernet port on the ZE500 printer can be connected to a plant-wide network and/or cloud-based communication system, enabling the labeler to send and receive track-and-trace data and print serialized 2D barcodes and more. It can be integrated with an optional vision system to inspect the printed labels and an optional reject device to automatically remove cases/bundles with faulty labels from the line. The 403 Print & Apply Labeler features heavy-duty components and construction, including a powder-coated floor base and aluminum vertical column mount, that maximize durability. Off-the-shelf electronics ease maintenance and help ensure long equipment life. Requiring only 40 inches (100 cm) of line space, the 403 can be installed over an existing conveyor or supplied with a new conveyor, as needed. An optional top hold-down roller provides additional package stability for superior labeling accuracy. Designed for easy use, the labeler accommodates a large 14-inch (35-cm) OD label roll to reduce the frequency of operator intervention, while the low label detector sends a prompt in advance to replace the label roll. The rewind spindle features a split shaft, enabling half the spindle to be separated for easy removal of the label backing. The product sensors have quick-disconnect plugs that can be replaced without rewiring. Operator adjustable pneumatic regulator controls include a low air pressure switch that sends an alert if the air pressure drops. When equipped with the optional swiveling yoke, the labeler eases access to the backside for improved ergonomics during maintenance. Now, with recipe-controlled electronic adjustments, the new 403 can be changed over to handle a new package and label size and configuration in less than 5 minutes with no tools required. NJM offers a “total solution” approach that includes full IQ / OQ validation support and turnkey line integration services to seamlessly combine best-in-class technologies. NJM’s world-class aftersales support includes standard and extended warranties, preventative maintenance programs and onsite installation, training and ongoing service. The world’s proven, trusted, single-source provider of automated packaging machinery for pharmaceutical, nutraceutical and personal care products, NJM offers both stand-alone solutions and integrated systems for packagers of solid dose and liquid pharmaceuticals, biopharmaceuticals, vitamins and food supplements. As part of the ProMach Pharma business line, NJM helps our customers protect and grow the reputation and trust of their consumers. ProMach is performance, and the proof is in every package. Learn more about NJM at www.NJMPackaging.com. ProMach is a family of best-in-class packaging solution brands serving manufacturers of all sizes and geographies in the food, beverage, pharmaceutical, personal care and household and industrial goods industries. ProMach brands operate across the entire packaging spectrum: filling and capping, flexibles, pharma, product handling, labeling and coding and end of line. ProMach also provides Performance Services, including integrated solutions, design/build, engineering services and productivity software to optimize packaging line design and deliver maximum uptime. ProMach designs, manufactures, integrates, and supports the most sophisticated and advanced packaging solutions in the global marketplace. Its diverse customer base, from Fortune 500 companies to smaller, privately held businesses worldwide, depends on reliable, flexible, technologically advanced equipment and integrated solutions. ProMach is headquartered near Cincinnati, Ohio, with manufacturing facilities and offices throughout the United States, Canada, Mexico, Brazil, Europe, United Arab Emirate and China. For more information about ProMach, visit www.ProMachBuilt.com.